The Arctic is still warming at twice the rate of anywhere else on Earth, and the region’s air temperatures in the past five years between 2014-2018 have exceeded all previous records since 1900, according to a peer-reviewed report released by the U.S. National Oceanographic and Atmospheric Administration (NOAA) on Tuesday. The agency’s 13th annual Arctic Report Card also concluded that 2018 was second only to 2016 in terms of the region’s overall warmth. Rising temperatures have resulted in rapid loss of sea ice.”In 2018 Arctic sea ice remained younger, thinner, and covered less area than in the past. The 12 lowest extents in the satellite record have occurred in the last 12 years,” the report said.This long-term warming trend has also resulted in “new issues … that we weren’t really anticipating,” Emily Osborne, an official with the National Oceanic and Atmospheric Administration who presented the Arctic report card, said at a Tuesday interview at the American Geophysical Union conference in Washington. Other noticeable changes driven by Arctic warming include declining terrestrial snow cover, the melting of the Greenland Ice Sheet and lake ice and increasing summertime Arctic river discharge, the report revealed. While the Arctic has become more green and opened more vegetation for grazing, NOAA pointed out that herd populations of caribou and wild reindeer across the tundra have declined by nearly 50 percent in the past two decades. In the Bering Sea off Alaska’s west coast, “ocean primary productivity levels in 2018 were sometimes 500 percent higher than normal levels and linked to a record low sea ice extent in the region for virtually the entire 2017/18 ice season,” according to the report. NOAA also warned that microplastic contamination is on the rise in the Arctic, posing a threat to seabirds and marine life that can ingest debris. In response to the report card, conservation groups pointed out that the consequences of a warming Arctic go beyond the region. “This is yet another stark reminder of climate change’s indelible mark on our world. Warming temperatures are thawing permafrost and shrinking Arctic sea ice. 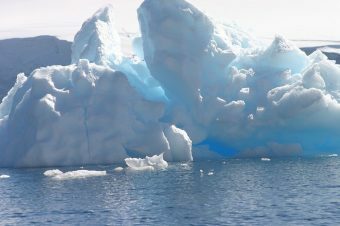 These changes rob wildlife species of their habitat, and raise sea levels around the world, affecting communities from Nome to New Orleans,” Margaret Williams, managing director of the World Wildlife Fund’s U.S. Arctic programs, said in an online statement.